Spa / Massage Hot Towel Cabinet Warmer with an Ultraviolet Sterilizer Lamp. Note that UV Sterilizers are really only Sanitizers that kills bacteria - They are not an Autoclaves. Capacity is 11 litres and holds up to 12 Facial cloths. This Hot Towel Cabinet heats up to 80°C. Includes one removable wired metal tray. Exterior dimensions - 41x32x25.5 cm (WxDxH). Interior dimensions - 33x23x14.5 cm (WxDxH). Uses a 3 watt screw in Ultraviolet bulb. Power specifications are 185 watts, 50/60 Hz and F2AL fuse plus thermal fuse. All our Hot Towel Cabinets come with a 12 months return to base warranty. What is the benefit of using the Ultraviolet Sterilizer Lamp? Kills bacteria with the ozone produced by the Ultraviolet Sterilizer Light. What are the main groups that buy this item? Main purchasers of this model have been specialists in Massage, Spa, Barber and Hairdressing. Operating instructions manual: Download PDF file. Hot Towel Cabinet, 11 litre with single shelf. Has been our best selling Cabinet for more than 10 years. This Compact Warmer has a Small Cabinet preferred by many Beauty Salons. External colour is white. Beauty Hot Towel Cabinet, 12 litre with 2 shelves and drip tray. Medium sized 18 litre Hot Towel Cabinet - This Warmer comes with 2 removeable shelves and door opens from left to right. 18 litre Hot Towel Cabinet - This Warmer comes with 2 removeable shelves and door opens from top to bottom. 30 litre Hot Towel Cabinet - This Warmer has been preferred by many Massage salons. 2 door 32 litre Hot Towel Cabinet - Suitable for Spa and Massage. Spa / Massage Hot Towel Cabinet - Large 82 litre Hot Towel Warmer with a single glass door and 3 shelves. This towel warmer has a separate control for the Ultraviolet Sterilizer Lamp which assists in killing bacteria. Can accomodate a Large Towel or Small Blanket. Sterilizer also has a timer function. Note this Sterilizer is not an Autoclave. Screw in type replacement UV Sterilizer globe (3 watt) for Hot Towel Cabinets. Non screw in type replacement Sterilizer globe (4 watt) for Hot Towel Cabinets. Packs of 8 white Salon Facial cloths (25 x 25 cm). Suits any Hot Towel Cabinet. Tool UV Sterilizer. 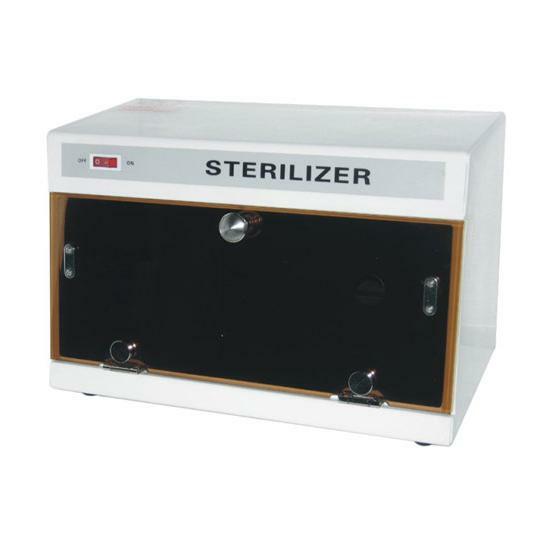 Sanitises instruments - This Sterilizer does not function as an Autoclave.